(white) clone [M. campbellii], cv. 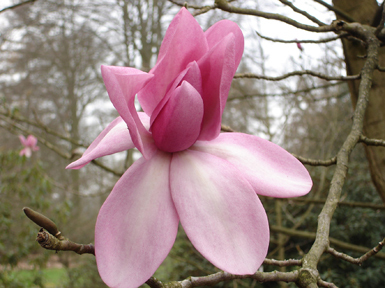 (Treseder's Nurseries Catalog, Circa 1973, p. 4, Truro, Cornwall, England), ‘A very large leaved form with many blossoms. ]M. sargentiana, M. sprengeri], cv. (Treseder's Nurseries Catalog p. 6, Circa 1965, Truro, Cornwall, England), ‘Produces very large heavily-textured, broad-petalled flowers of bright salmon pink in great profusion.’ First grown at Caerhays Castle, Cornwall, England. (M. sargentiana var. robusta x M. sprengeri cv. Diva). ]M. obovata], cv. (Treseder's Nurseries Catalog, Circa 1973, p. 7, Truro, Cornwall, England). A selected clone. ]M. grandiflora], cv. (Bosse, Vollst. Handb. Blumeng., Ed. 2, 2: 465. 1841), Calyculate, bracts resemble calyx. In Bouche & Bouche, Blumenzucht 2: 716 (1855). ]M. campbellii], var. - The typical variety. [M. grandiflora], cv. (Bosse, Vollst. Handb. Blumeng., Ed. 2, 2: 465. 1841), tepals canaliculate, channelled, longitudinally grooved. in Loudon, Encycl. Trees & Shrubs p. 23 (1842), as ‘canalicule’ from Leroy of Angers, France. in Baumann, cat. p. 26 (1842), cultivated in Bollwiller & Mulhouse, France. ]M. liliiflora], var. (Spach) Pampanini, Bull. Soc. Tosc. Ort.41: 139. (1916), flowers white, blooming with the leaves. Probably = M. denudata. ]M. acuminata], cv. (de Candolle, Prodr. 1: 80, 1824), as ‘Candolii.’ syn. : M. decandollei (Savi in Bibl. Ital. Milan. 16: 224. 1819); M. candollei (Link, Handb. Erkenn. Nutzb. 2: 375. 1831), flowers greenish. ]M. x soulangeana, M. x veitchii(? )], cv. (Callaway, Dorothy J. The World of Magnolias, p. 213, 1994). ‘Flowers with 9 erect tepals in three whorls, each whorl having a distinct coloration. The outer whorl is also somewhat reduced. Outer tepals are rose at base fading to white at tip, with a rose stripe running from base to tip. Middle whorl of tepals has similar coloration, but slightly darker. The inner whorl is even deeper rose-purple at the base. 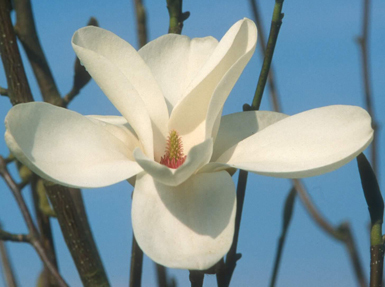 Selected and named by John Allen Smith, Magnolia Nursery, Chunchula, Alabama, from Todd Gresham's hybrids at Gloster Arboretum, Gloster, Mississippi.’ (Parentage uncertain). Syn. : JG#28. ]M. virginiana], cv. (Knight ex Loudon, Encycl. Trees & Shrubs 26. 1842), ‘Imported from Belgium, where it was found by Mr. Knight of the Exotic Nursery, in the nursery of M. Cardon, after whom he has named it.’ Given as M. glauca cardonii. [M. acuminata var. subcordata x M. denudata] cv. 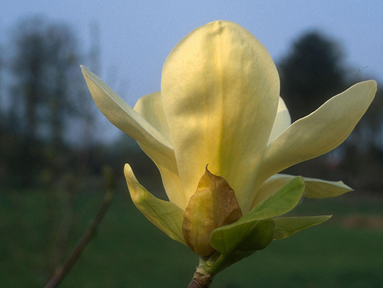 (Magnolia 38(2) [Issue 74]: 26-27, 2003) This hybrid produces fragrant, creamy yellow flowers of firm substance just before and together with emerging leaves, and have good resistance to Spring frosts; they remain upright until the end of their bloom period; sepaloids are 3-5.5cm (1.18-2.17in) long and 1.2-1.5cm (0.47-0.59in) long, are papery and greenish yellow; petaloids are 7-9cm (2.76-3.54in) long and about 3.5cm (1.38in) wide, are pale yellow (RHS 8D) within and greenish-yellow (RHS 1C) to yellow-green (RHS 145A) on the outside at the base to pale yellow (RHS 9D) at apex; the stamens have pale anthers and short, deep purple-red filaments; the gynoecium is greenish with pale styles; selected, named and registered (May 23, 2003) by Koen Camelbeke and Philippe de Spoelberch of Arboretum Wespelaar, Belgium. [M. liliiflora 'Nigra' x M. campbellii ssp. mollicomata] cv. 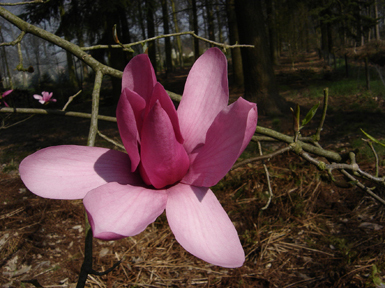 (Magnolia 40(1) [Issue 77]: 16, 2005) This free-flowering, precocious hybrid produces its large, deep purple (RHS 71A) flowers over a three to four week period; the nine oval tepals are up to 14cm (5.5in) long and 9cm (3.54in) wide; tips of mature tepals are a silvery cyclamen purple (RHS 74D) , inner tepals are light violet purple (RHS 80D); large stamens are reddish purple margined with a lighter salmon shade (RHS 27A); habit is upright and vase-shaped when young, becoming more rounded with age; estimated mature height is 7-8m (23-26ft); predicted hardy to USDA zone 8 (perhaps zone 7); originated at Duncan & Davies Nurseries of New Plymouth, Taranaki, New Zealand; selected and named by Vance Hooper, registered on September 12, 2004 by Jim Rumbal. ]M. grandiflora], cv. (Gresham, Morris Arb. Bull. 14: 25, figs. 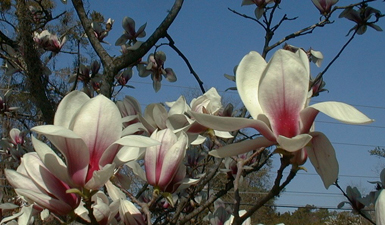 16-18, 1963), Tree wide-spreading, blooming profusely over a long period. Leaves large, lustrous, indumentum moderate, flowers very large, to 15 in. (37.5 cm). in diameter. ]M. stellata], cv. 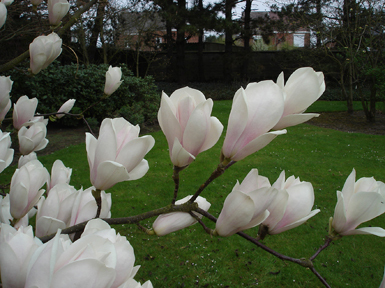 Large flowers (to 5 1/4 inches diameter) mostly white, but sometimes showing pink from its parent cv. 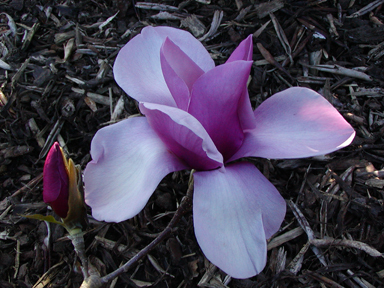 rosea, raised at Weston, Massachusetts by the Arnold Arboretum and named in its centennial year, 1972. Offered in 1975-1976 price list of Gossler Farms Nursery, Springfield, Oregon. ]M. coco], var. 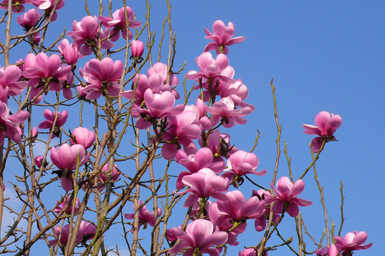 (Bentham) Millais, Magnolias, p. 560 1927). Basionym: M. championii (Bentham, Fl. Hong Kong. 8. 1861). syn. : M. pumila var. championii (Bentham) Finet & Gagnepain, Mem. Soc. Bot. France 1 (4): 36 (1906); M. liliifera var. championii (Bentham) Pampanini, Bull. R. Soc. Tosc. Ort. 41: 136 (1916). ]M. pumila], var. (Bentham) Finet & Gagnepain, Mem. Soc. Bot. France 1 (4): 36. 1906) = M. coco var. championii. ]M. sieboldii, M. tripetala], cv. (Hilliers Man. of Trees and Shrubs, 1973). 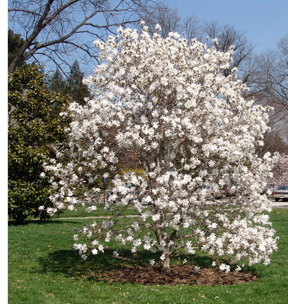 A distinct and interesting hybrid making a large bush or small tree. Flowers fragrant, creamy-white with a conspicuous centre of reddish stamens, resembling those of M. tripetala, and produced with the leaves in May and June. Raised at Kew. = M. x cv. Charles Coates. (M. sieboldii x M. tripetala). 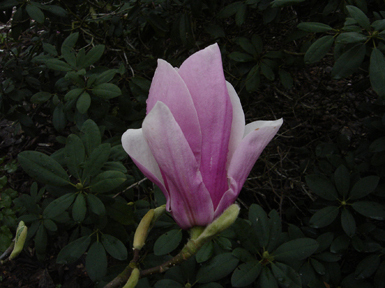 ]M. grandiflora, (unknown)], cv. (Templeton, Morris Arb. Bull. 16: 8. 1965), Cones vivid red, lasting 6-8 weeks in autumn. type tree from Franklin County, Tennessee. 2N=76, A tetraploid, indicating this cultivar is a hybrid and only partly M. grandiflora. ]M. campbellii], cv. (The Crown Estate Commissioners, The Great Park, Windsor, Berkshire, England, in Jour. Roy. Hort. Soc. 88: 494, figs. 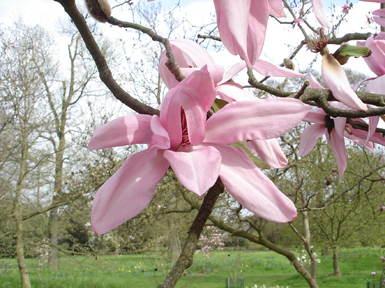 173-174, 1963), Vigorous grower, reaching 40 ft. in 14 years, spreading 20 ft.; flowers rose bengal (RHS 25/2-25/1) to 9 in. across, tepals 12, slightly scented. Type at Windsor. [M. x raffillii], cv. (Treseder’s Nurseries cat. p. 6, circa 1965, Truro, Cornwall, England) = M. campbellii cv. Charles Raffill. ]M. sargentiana], cv. (Otto Eisenhut nursery catalog, p. 5, 1989, Ticino, Switzerland). Nomen nudum. Listed as variety of M. sargentiana var. robusta. ]M. sprengeri], cv. (Lord Aberconway, National Trust, Bodnant, Tal-Y-Cafn, Colwyn Bay, Denbighshire, North Wales, in Jour. Roy. Hort. Soc. 88: 494-495, fig. 172. 1963), flowers to 8 in., saucer-shaped, slightly scented, solferino purple (RHS 26/2-26/3), the inside fading to white, tepals 12-14, narrowly-obovate. ]M. dawsoniana], cv. (Otto Eisenhut nursery catalog, p. 2, 1989, Ticino, Switzerland). ‘Large rich pink flowers.’ = M. dawsoniana cv. Clarke. ]M. grandiflora], cv. (Magnolia 25(1) [Issue 47]: 19, 1989). ‘A selection with a broad, pyramidal habit and a long flowering season (May to September); Produces small flowers, 8-10 CM. in diameter, and small, heavily indumented (brown) leaves 10-18 CM. long by 5-8 CM. 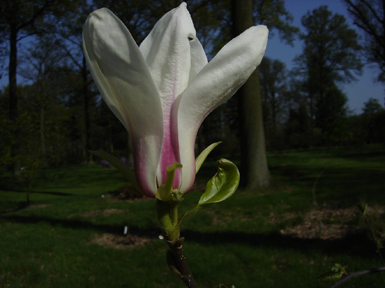 wide.’ Selected and introduced by J. Brailsford, Shady Grove Nursery, Orangeburg, South Carolina (Magnolia 23(2): 6, 1988). ]M. coco], var. - The typical variety. ]M. grandiflora], cv. (A. & E. Kay, Pl. World Fla. 32. 1933), Growth erect like a lombardy poplar: foliage and flowers medium-sized; flower-buds slender, pointed. ]M. stellata], cv. (Michigan State University, Magnolia Check List), nomen nudum. Cultivated on campus. ]M. obovata], var. (Siebold & Zuccarini, Abh. Math.-Phys. Kl. Akad. Wiss. Muenchen 4 (2): 187. 1845), leaves green both above and beneath. ]M. salicifolia], var. (Miquel) Franchet & Savatier, Enm. Pl. Japon. 1: 16. 1873). Basionym: talauma salicifolia f. concolor (Miquel, Ann. Mus. Bot. Lugd.-Bat. 2: 258. 1866). Leaves green beneath. Per Bean, Trees & Shrubs Brit. Is. 3: 223-224 (1933), habit more spreading, branches stouter, flowers larger, petals broader, to 1 in. wide, blooms later. introduced from Japan by James H. Veitch about 1892. ]M. grandiflora], cv. (Magnolia 20(1) [Issue 37]: 15, 1984). ‘Said to have the largest flowers on record - 14 inches across.’ Registered by Inez B. Conger, Arcadia, Florida. M. grandiflora], cv. (Borromeo, letter dated 6 June 1915, to Pampanini, Bull. Soc. Tosc. Ort.41: 78. 1916), tree a century old, 21 m. tall, cultivated on Isola Borromeo, Italy. ]M. x soulangeana], cv. (Iufer Landscape Co., Nursery List, 1961, Salem, Oregon), nomen nudum. Probably = cv. Alba or M. denudata. ]M. grandiflora], cv. (Woodlanders, Inc., Nursery Catalog, p. 27, 1990-91, Aiken, South Carolina). Nomen nudum. ]M. acuminata], var. (Michaux) Seringe, Flore des Jardins 3: 229. 1849), Als. in Sargent, Amer. Jour. Sci. III, 32: 473 (1886) = M. cordata. However, if one accepts this as a variety of this species, the correct name is M. acuminata var. subcordata. See Dandy, Amer. Jour. Bot. 51: 1056, footnote (1964). ]M. acuminata subsp. subcordata], var. - The typical variety. ]M. x soulangeana, M. x veitchii], cv. (Gresham, Morris Arb. Bull. 13: 48. 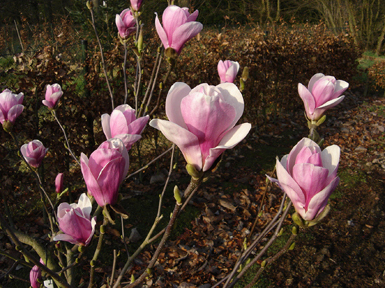 1962), Vigorous grower, branches wide-spreading, tepals with crimson-red pin-points on white which forms a luminous pink glow. (M. x soulangeana cv. Lennei Alba x M. x veitchii). ]M. grandiflora], cv. (Loudon, Hort. Brit. 226. 1830), Leaves crisped, margin ‘curled’ or undulate. ]M. virginiana], cv. (Callaway, Dorothy J. 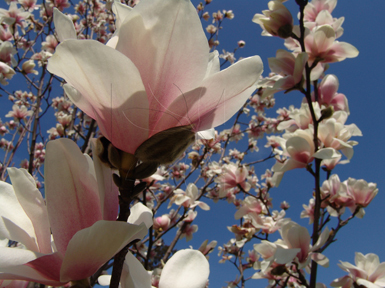 The World of Magnolias, p. 79. 1994). ‘Exceptionally glossy upper surfaces of the leaves. Selected by J. C. McDaniel from Polk County, Tennessee, ca. 1976.’ (M. virginiana var. australis). ]M. x soulangeana], cv. (Otto Eisenhut nursery catalog, p. 3, 1989, Ticino, Switzerland). Nomen nudum. (Callaway, Dorothy J. The World of Magnolias, p. 214, 1994). 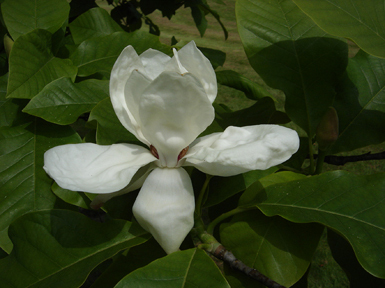 ‘This Gresham hybrid has cream-colored flowers. The flowers are fragrant and reach 12 in. (30.5 cm) across. 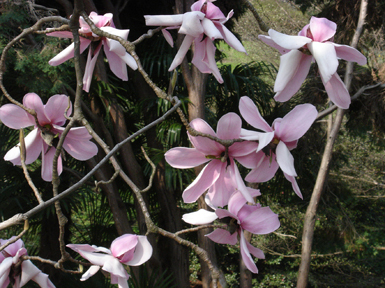 Named by Ken Durio of Louisiana Nursery, Opelousas, Louisiana.’ (M. x soulangeana cv. Lennei Alba x M. x veitchii). ]M. acuminata, M. x veitchii], cv. (Callaway, Dorothy J. The World of Magnolias, p. 225, 1994). ‘This is a tall upright tree with dense habit. 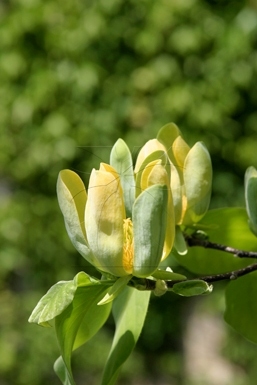 Leaves have revolute edges, and flowers are described as pastel pink and yellow on white. Named by Savage in 1990, formerly published under the name ‘Editor Hopkins. '‘ (M. acuminata cv. Fertile Myrtle x M. x veitchii cv. Peter Veitch). See: cv. Editor Hopkins. ]M. precia], cv. (Rinz, catalog 1853, Frankfurt Am Main, Germany), ex Petzold & Kirchner, arb. Muscav. 117 (1864), per synonymy = M. x soulangeana cv. Cyathiformis. ]M. denudata], cv. (Pampanini, Bull. Soce Tosce Ort. 40: 199. 1915) = M. x soulangeana cv. Cyathiformis. ]M. X soulangeana], cv. 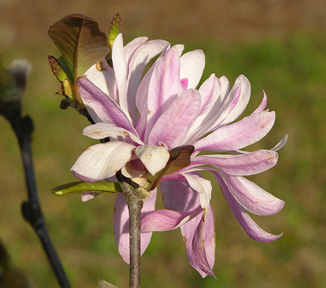 (A plant is cultivated at the Arnold Arboretum in Jamaica Plain, Massachusetts under this name. No description available.). May be a seedling of M. cylindrica.